You want to have a great tip how not to get discovered by your humans when you’re blogging? Then keep your cat eyes on this blog fellow cuties. I recently came in their family and I am really lucky to have met these people on my path you know. It is such a sweet, loving and caring family. They are a bit weird though (as all humans are), but I think I can manage that. You wanna have a little insight on this family? Well I don’t know if you can handle their mentally defective way of life, so I’ll give you the neat details about them. This is the male of the family is the most stubborn and walking appendix of the whole family. He runs an coffee import company ever since 1989 and besides making a mess in his office his eyes almost pop out from drinking caffeïne all day. Sometimes when I play in his office I even really can’t find my way back to the door. The little girl, well she is 24, but really very elfin in height; seems to be a famous hyper realistic drawing artist and former child prodigy: whatever that means. Well I don’t know if I’m happy with that, but it will do. Anyway; she stalks me all day long with a ‘phone thing’ and yells ‘aawwweeee sweety! !’ in my ears. Don’t know if I’m happy about that either. Then we have the tall one, the middle aged (ex-super)woman, co owner of their business, former kids TV producer, who thinks she’s a Tarot reader now. She runs this family madness and plays referee between father and daughter discussions. She has had a mega creative life and she gives me a very exhausted impression. Anyhoo I wanted to do what all, well many people, do too: blogging. I’m maybe not that good in writing blogs; but hey I am a cat aren’t I. So once in a while I see this unmanned apple-thing (they call it iPad) or laptop and then jump right on it. It is really amazing that they are all standing in contact with one another around this entire globe. We cats have a more boring simple life (like humans use to have once back in the days). Like when they used to walk around in their self ripped sheep trousers as cave men. That was some kind of amazing fashion. Hunting for food like we use to do ages ago. Well maybe it wasn’t even real boring, because once in a while their unpresentable (at least nowadays) head with hair ended up in some lion’s mouth. Those are real big pussies you know; they are like the ‘Rambo’s’ amongst the cats species. Anyway we lay and play around all day and we have to do it with the cats close to our neighborhood. We really don’t have the luxury to chitchat with kittens and cats at the other end of the planet. But that’s ok too. I don’t have that much time spending all day online watching all other cats on earth embarrassing themselves with cat memes and disturbing selfie poses. I am not that interested knowing what every animal on earth is doing with his lifetime. I rather move myself through the days and enjoy, experience and learn from whatever I encounter. But as you see I’m making time to come online as you all do, but only once in a while. I think that Celesta is even suspecting that I maybe use their digital aquipment and I don’t know if she will be happy about that. 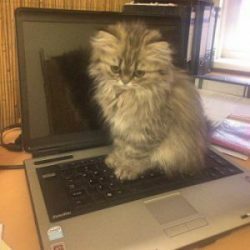 And for all you fellow felines: my protocol to take possession of the electronic writing-machines is to first wait until there is an unguarded moment, jump on the portable computer and write your thing. Or ofcourse do whatever else you want to do on the world wide human web. Then when you have finished your online adventure (because humans are insight), you calmly lay down on top of for example that write thing. It automatically switches off and it then also seems that you were just taking advantage of the delightful warmth of the portable thing heath. At least that’s what they are thinking around here. Well anyway I have to watch out and be more careful because I really don’t want them to discover a blogging cat. Next thing you know is that they put me to work; I don’t want a working life. I just want a normal lazy cat life with lots of fun adventures and writing a little blog once in a while to express my animal thoughts and feelings. So for now: see you next time when I will take you further on my adventures in this family.